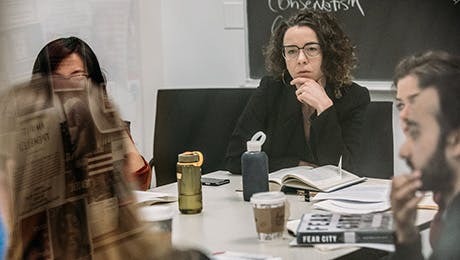 The 30-credit MA in Historical Studies combines training in history with coursework in the range of disciplines housed at The New School for Social Research. Our practice of interdisciplinarity rigorously engages distinctive ways of understanding the world. Equipped with a robust critical apparatus for thinking about the modern world, our graduates pursue a wide variety of professional and academic careers. Students enrolled in our terminal MA in Historical Studies receive intensive mentoring and collaborate with our faculty on a sustained basis. We prepare our students in the critical assessment of scholarship, the diverse methodologies of historical research, and the imaginative act of relating history to the contemporary world. The program has been particularly attractive to students who wish to become more broadly educated historians or more historically informed social scientists. Many graduates of the MA program enter PhD programs at The New School for Social Research or in history departments at other top universities. Others pursue teaching, journalism, activism, government service, and other fields. A full account of degree requirements and procedures is contained in the Historical Studies departmental handbook. To earn the MA in Historical Studies, a student must complete a total of 30 credits with a minimum grade point average of 3.0. At the end of their first year of coursework, after completing both required courses, students submit a proposal for an MA Thesis project to their primary faculty advisor. If the proposal is approved, students work on their Thesis Projects in their second year. Students will write their thesis as an independent study under the supervision of their thesis advisor. Students in their second year of the MA in Historical Studies (or thereafter while still in residence) may apply for admission to the PhD in Politics or PhD in Sociology at The New School for Social Research, with a specialized minor field in Historical Studies. The aim of the specialized minor in Historical Studies within the PhD in Politics or Sociology is to provide integrated training in history and social science for scholars with strong interests in both fields. Students accepted for doctoral studies by both the Committee on Historical Studies and the other department must work closely with both faculty advisors to design a coherent program of study and prepare qualifying examinations that will cover their work in both fields. Acceptance is not automatic but is at the discretion of both the Committee on Historical Studies and the other department. Applicants must provide the following materials to the secretary of the Committee on Historical Studies: a letter of intent, explaining the applicant's scholarly interests and rationale for including historical studies as part of advanced social scientific research; a transcript of coursework completed at The New School for Social Research; a three-page prospectus of the student's plans for doctoral research (this is not a formal dissertation proposal); and, a letter of support from the student's MA program faculty advisor. Students whose applications for the PhD program have been accepted by both faculties must file a change of status petition with the Office of Academic Affairs of The New School for Social Research.